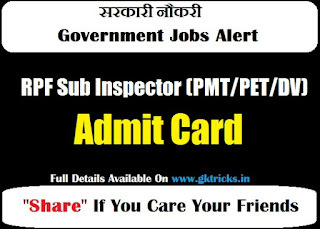 RPF Sub Inspector (PMT/PET/DV) Admit Card 2019:- To download Admit Card of RPF Sub Inspector (PMT/PET/DV) Exam, read this article till the last. RPF advertised this exam some days ago. RPF has done this exam for the recruitment of Sub Inspector (PMT/PET/DV). The last date for applying for this examination was 30 June 2018. Below is a way to download an admit card for RPF Sub Inspector (PMT/PET/DV). And the link to view the result is given at the end of this post. RPF has advertised this recruitment test on its official website (rpfonlinereg.org). And this examination is being taken for 1120 posts. The minimum educational qualification for applying in RPF Sub Inspector (PMT/PET/DV) examination was degree. Candidates have participated in this recruitment. Admit Card of this examination can be obtained online. The last date for applying for RPF Sub Inspector (PMT/PET/DV) examination was 30 June 2018. The results of RPF Sub Inspector (PMT/PET/DV) examination will also be announced on this website. 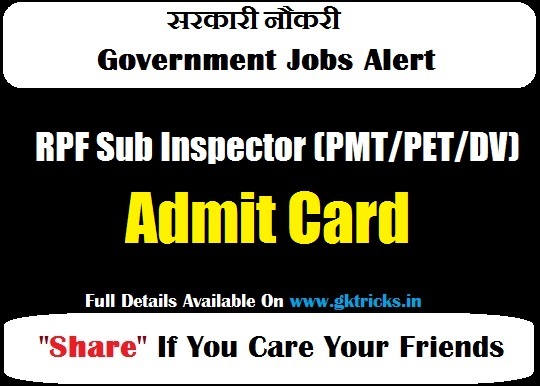 When the RPF Sub Inspector (PMT/PET/DV)'s Admit Card link appears, click on it. You can use the following link to see all the information from the notification of RPF Sub Inspector (PMT/PET/DV) Department's examination to the final result. Below we also provided the direct link for downloading Admit Card. After the Admit Card, we will give you information about the results soon.